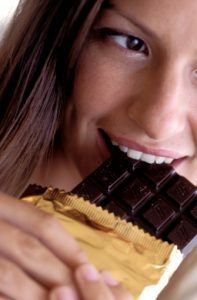 Chocolate lovers rejoice – your favorite treat can also be good for you! In recent years, scientists have been learning a lot about the possible health benefits of dark chocolate. Chocolate lovers rejoice – your favorite treat can also be good for you! Keep in mind that some dark chocolate can also be high in sugar, so be on the lookout for that. Dark chocolate contains a number of vitamins and minerals that will support your overall health. It is particularly high in potassium, copper, magnesium, and iron. Copper and potassium help protect your heart; iron helps prevent iron deficiency and anemia. Magnesium will help prevent type 2 diabetes, high blood pressure, and heart disease. If you eat a small amount of dark chocolate two or three times a week, it can help lower your blood pressure, which is not only good for your heart health but helps a lot of other bodily functions, too. Nutrients in dark chocolate help to improve blood flow, which can help prevent the formation of blood clots. It can also prevent arteriosclerosis, or hardening of the arteries. Since dark chocolate aids blood flow, it also helps increase brain function. In turn, this can also reduce your risk of stroke. Along with the brain health benefits of dark chocolate, it can also be good for your mental health as well! When you fall in love, your brain produces a chemical called phenylethylamine (PEA). Chocolate contains PEA, and the high content of cacao in dark chocolate means that it has even more PEA than other chocolates. PEA prompts your brain to release endorphins, so eating dark chocolate can actually help make you feel happier. Dark chocolate also contains small amounts of caffeine. Don’t worry, chocolate isn’t trying to replace your morning coffee! In a 1.5 ounce chocolate bar, there’s about 27 milligrams of caffeine. An 8 ounce cup of coffee, on the other hand, has about 200milligrams of caffeine. Dark chocolate contains huge amounts of antioxidants. Antioxidants help rid your body of free radicals. Free radicals cause your body all sorts of damage, including oxidative damage to cells, aging, and possibly even cancer. Eating antioxidant-rich foods, like dark chocolate, can really help your health. Get the delicious health benefits of dark chocolate from Wockenfuss Candies! Dark chocolate malted milk balls – a crispy malted center covered in a layer of dark chocolate. These are also available in milk chocolate. Jumbo dark chocolate peanut butter cups – At about two inches in diameter, our peanut butter cups are sweeter, smoother, and creamier than the ones in regular grocery stores. They are made by covering smooth, creamy peanut butter in a thick layer of Wockenfuss dark chocolate. Also available in milk chocolate. Breakup chocolate – These are bars of solid, delicious Wockenfuss dark chocolate. Available for purchase in one or two pounds of dark chocolate or milk chocolate. This entry was posted on Friday, August 18th, 2017 at 4:59 pm. You can skip to the end and leave a response. Pinging is currently not allowed.